Check out our review of the Nokia Lumia 1020 phone. We’ve got a good idea Nokia will announce the Lumia 1020/Nokia EOS on July 11, and over the past few months we’ve already seen leaked shots of its body shell, and several none-to-subtle promo pieces by Nokia itself. Now, prodigious phone leaker @evleaks has joined in with the fun once again, and has posted an official looking image of the phone on Twitter. The snap will be familiar to phone fans, as it’s a typical press-style image of the device from the front, but it does hold a few more details than one usually expects. The first is the AT&T branding, suggesting the new Lumia camera phone will be headed to the network following its announcement, plus there is a new application visible on the Windows Phone Start screen, named Nokia Pro Cam. All the information on the Lumia 1020 has pointed to the phone being the first Windows Phone handset to boast the full PureView camera experience, so such an app makes sense. It’s not the first time Nokia will have added a dedicated, special edition camera app to one of its new phones either, as at the launch of the Lumia 925, it introduced the Nokia Smart Camera app. Pre-installed on the Lumia 925, Smart Camera improves your action shots, and will become available for all Lumia devices once the Amber software update is released. We’ll have to wait to find out what Pro Cam is all about, but we wouldn’t be surprised if it was a comprehensive editing suite to make the best of the PureView pictures. The phone’s design looks very similar to most other high-end Lumia smartphones, but we know it’ll be different around the back, as the 41-megapixel PureView camera needs a fair amount of room to breathe. 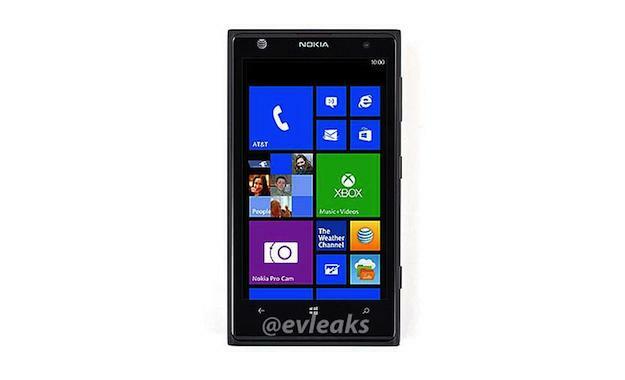 That said, it does look more compact than the 808 PureView Symbian phone, which is where the technology made its debut. Nokia’s event will take place on July 11 in New York, where the announcement of the Lumia 1020 seems like a foregone conclusion, and we’ll bring you all the news on the day.